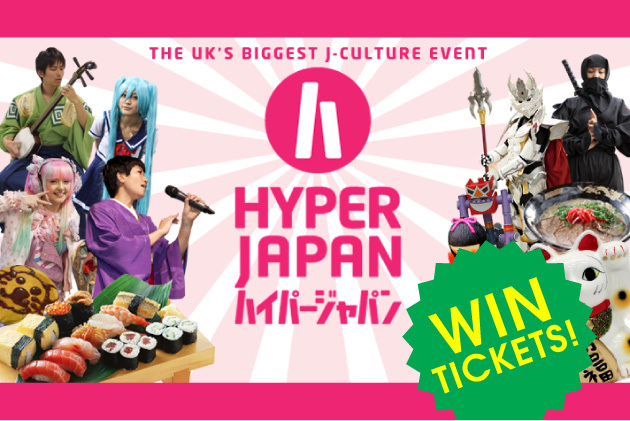 COMPETITION: Hyper Japan is here! And so are free tickets! Yes, that’s right the UK’s biggest weekend long J-Culture party is back! From the Friday 26th to Sunday 28th July, Hyper Japan will transform Earl’s Court London with Japanese cuisine, traditions and “A hadouken force punch of pop culture“, whoa! Of course Japancentre.com will be there with snacks, manga and treats galore! We love Hyper Japan so much, we’re also giving away a pair of tickets to Hyper Japan for Saturday 27th July. So, if you want to get in on the action, here’s how to enter! Simply leave your answer in a comment on this post, or if you prefer you can head over to our Facebook page and leave a comment on the post there. You can even re-tweet your answer if Twitter is your social platform of choice! We will choose a random winner next week so make sure you get your answer in as soon as possible! Even if you don’t win our competition, you can still buy tickets for the event at the Hyper Japan website. I love sushi so much. When I was in Tokyo, I used to eat sushi three times a week! I also like wagashi because I practice the tea ceremony. Okonomiyaki is my favourite Japanese dish – it’s the sauce on the pancake that does it, it’s so good! I absolutely love Japanese curry! I make it for my mother as she loves curry too but can no longer eat very hot food. It has lots of flavour without too much chilli. It’s also really simple to make using curry cubes and leftover roast chicken. It makes me hungry just writing about it! It must definitely be Unagi – it’s an acquired taste, but very special when cooked just right! However, I haven’t found a restaurant in London serving Unagi to the same standard as in Japan… Please let me know if you have any recommendations. I have tried it many times when I go out with my parents and it tastes delicious. I love it so much and I even tried making it once but I couldn’t as it’s really hard and complicated. I’m even having some sushi right now as I write about it. Definitely chicken katsu curry. I always choose this if at a Japanese restaurant, yum! A big thank you to everyone who entered! The competition is now closed and we’ll be contacting the winner shortly. Don’t worry if you didn’t win this time, we’ll be offering another chance for everyone to win soon! I love sushi. All kinds of sushi filled with all sorts of things! Yum! Okonomiyaki, Inari sushi, taiyaki and dorayaki (anything -yaki) are my absolute favourites! JAFF: Japan Food Festival Hokuriku is Here!